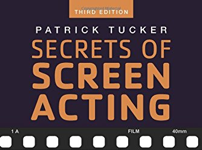 It’s hard to believe how much better my acting life is than it was before I read Secrets of Screen Acting, by Patrick Tucker. If you’ve ever heard me talk about going from just one episode on Heroes (that’s all my character was supposed to survive) to three seasons recurring on the show, you’ve heard me mention this book was, in large part, the reason that happened. And even better: everything in this book is applicable to your VO career as well. I am so excited – the 3rd edition is awesome. So awesome, that I’ve decided to give a copy away. Maybe even two or three copies. All you need to do to be eligible to win one is to write a comment below, congratulating Patrick Tucker, the author, on the book’s third edition. Maybe a comment or two on how Secrets of Screen Acting, or what I’ve said about it, has been helpful to you. If you’ve never read the book, go get it. Immediately. And in the meantime, write a nice note anyway in the comments below. In this new edition, Patrick Tucker retains the engaging style and useful structure of the first and second editions, while addressing significant changes in current technology, ensuring that this volume will remain an indispensable resource for contemporary students of screen acting. Updated for a new decade of screen performance possibilities, Secrets of Screen Acting is a magician’s box of acting tricks for today’s performer and makes the distinction between acting for the stage and for the screen. He explains that the actor, instead of starting with what is real and trying to portray that on screen, should work with the realities of the shoot itself, and then work out how to make it all appear realistic. Tucker has created and developed several screen acting courses, and this book is an extension and explanation of a lifetime of work in the field. Containing over fifty acting exercises, this book leads the reader step-by-step through the elements of effective screen acting. If you have read the book, then writing a nice note to him will be a snap. And if there are some real knockouts, maybe I’ll give away a couple more. Not many authors get to se a 2nd edition and you are rocking your 3rd! If David reccomends it, theres got to be a reason! Got an idea, David, why don’t you record the audiobook? Congrats on the 3rd edition! I loved reading edition #1 and listening to edition #2! Now I just need to pick up edition#3 for my niece. Perfect timing! I bought the book and the podcast “Secrets of Screen Acting” years ago, and I love it. I listen in my car on short rides and gain great insight and get reminded of terminology. CONGRATULATIONS! This sounds like a great book and I will pick up David’s audio version of it. You are awesome! Super Uber Major Kudos Patrick!!! Thank you for such a great resource. You all both are a wealth of knowledge and have helped me be able to take successful Massive Action toward achieving my acting and voiceover goals. Congrats to both of you guys! Congratulations on the new edition, Patrick! There can never be enough practical, usable tips for actors out in the universe. Glad there are people like you who put so much work into sharing their knowledge. It doesn’t go unnoticed or unappreciated. Patrick, many hats off to you! I love your book (listening to audio version) and learn from it every day. Congratulations on the third edition! 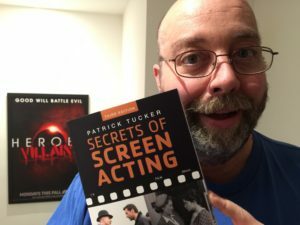 Much applause to you Patrick on the new 3rd edition of your book, Secrets of Screen Acting! This book comes HIGHLY recommended and I cannot wait to get my hands on a copy. It’s obvious your work has been making a career upgrade for many performers through the years and I look forward to joining their ranks in the days ahead. Cosign on all the previous comments. Can’t say anything else that hasn’t been said about Secrets of Screen Acting. Thanks for helping and empowering me as a performer!